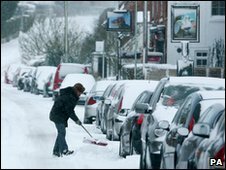 Heavy snow which fell in parts of east and south Kent earlier has led to further travel disruption. Kent Police said Operation Stack was in place, which involves parking lorries destined for the continent on the M20. The move was necessary, the force said, because of large amounts of traffic building up on the approaches to the Port of Dover and the Channel Tunnel. The weather also continued to cause problems for drivers using coastal routes, while rail users faced delays. Southeastern trains between Ramsgate and Ashford International were delayed for up to 40 minutes because of the snow, as were trains between Faversham and Dover Priory and between Canterbury West and Ashford International. 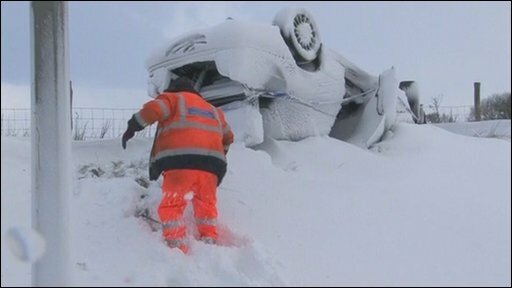 Eurotunnel shuttle services resumed a limited service, following a snow-clearance operation in Folkestone earlier. On Eurostar, an earlier signalling problem in Kent continued to cause delays throughout the day. Police said phase one of Operation Stack had been implemented, which involves the closure of the M20 coast-bound carriageway between junction 11, the Hythe turn-off, and junction 12, the Cheriton turn-off at Folkestone. All coast-bound traffic was being forced to leave the motorway at junction 11. Lorries were allowed back down on the motorway to park between the two junctions. All other traffic was being diverted on to the A20. The A299 Canterbury Road West in Ramsgate was blocked both ways due to ice and snow between the Lord Of The Manor roundabout and the B2048 Minster Road. Up to 15cm (6in) of snow fell overnight in some areas and strong winds caused drifting in places. More than 160 schools in the area between Margate and south of Ashford closed for the day. The pharmaceutical firm Pfizer's research and development site in Sandwich was also shut, affecting 2,500 members of staff. And engineers have been trying to restore power to residents and businesses in the Deal area after the electricity went off in the early hours. The snow started falling in Kent and East Sussex on Wednesday evening, with many drivers taking hours to get home. Dover's coastguard was called on to help dig out a stranded ambulance in the town. A spokesman said four of its 4x4 vehicles were helping to transfer staff and patients to and from hospitals in Eastbourne and Hastings. 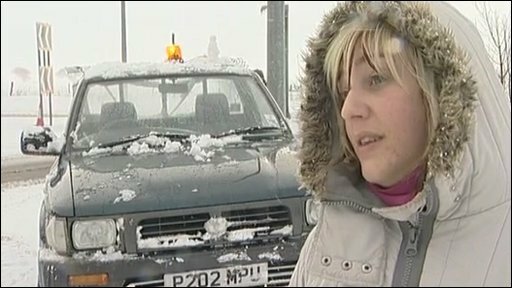 Kent Fire and Rescue Service said it had received "a few" calls from motorists stuck in snow drifts in parts of the county including Margate and Lydd.